Is Under Armour Inc (NYSE:UA) Worthy of Your Portfolio? A market correction in the fourth quarter, spurred by a number of global macroeconomic concerns and rising interest rates ended up having a negative impact on the markets and many hedge funds as a result. The stocks of smaller companies were especially hard hit during this time as investors fled to investments seen as being safer. This is evident in the fact that the Russell 2000 ETF underperformed the S&P 500 ETF by 4 percentage points during the first half of the fourth quarter. We also received indications that hedge funds were trimming their positions amid the market volatility and uncertainty, and given their greater inclination towards smaller cap stocks than other investors, it follows that a stronger sell-off occurred in those stocks. Let’s study the hedge fund sentiment to see how those concerns affected their ownership of Under Armour Inc (NYSE:UA) during the quarter. Is Under Armour Inc (NYSE:UA) a first-rate stock to buy now? The best stock pickers are becoming more confident. The number of bullish hedge fund positions inched up by 6 in recent months, and the company was in 28 hedge funds’ portfolios at the end of September. Under Armour wasn’t one of the 30 most popular stocks among hedge funds. “The company reported 3Q18 results which reflect ongoing operational improvements focused on several supply chain initiatives. North American revenue trends started to show signs of improvement and international sales remain strong. Margin expansion is a positive sign there was better product mix and less promotion activity. The investment thesis remains the same. Kevin Plank started the company in 1996 from his grandma’s basement and has grown the brand over the last 22 years. The Company has focused on creating a brand based on providing high quality performance apparel to athletes, growing with the sports apparel market and gaining share from Nike and Adidas. Since going public in 2006 through the end of 2016, sales grew greater than 20% a year. Starting in late 2016, sales and profitability slowed as North American sports apparel industry faced headwinds combined with several company specific setbacks. Even though Saga Partners is quite optimistic about the company’s business, we still think the stock requires further analysis and comparison with stocks of similar market caps. At the end of the third quarter, a total of 28 of the hedge funds tracked by Insider Monkey were long this stock, a change of 27% from one quarter earlier. 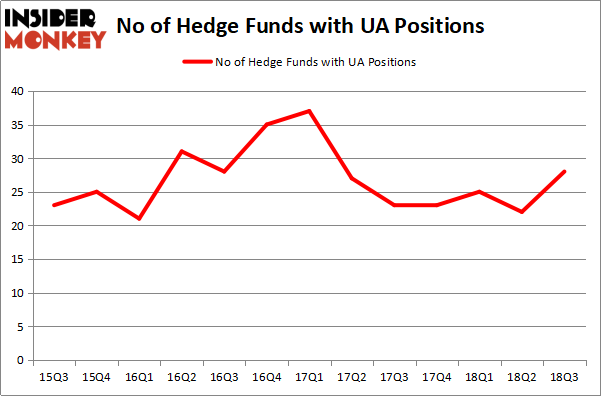 The graph below displays the number of hedge funds with bullish position in UA over the last 13 quarters. So, let’s find out which hedge funds were among the top holders of the stock and which hedge funds were making big moves. Among these funds, Bares Capital Management held the most valuable stake in Under Armour Inc (NYSE:UA), which was worth $197.7 million at the end of the third quarter. On the second spot was Adage Capital Management which amassed $125.3 million worth of shares. Moreover, Alyeska Investment Group, D E Shaw, and Citadel Investment Group were also bullish on Under Armour Inc (NYSE:UA), allocating a large percentage of their portfolios to this stock. With a general bullishness amongst the heavyweights, key hedge funds have been driving this bullishness. Renaissance Technologies, managed by Jim Simons, assembled the most valuable position in Under Armour Inc (NYSE:UA). 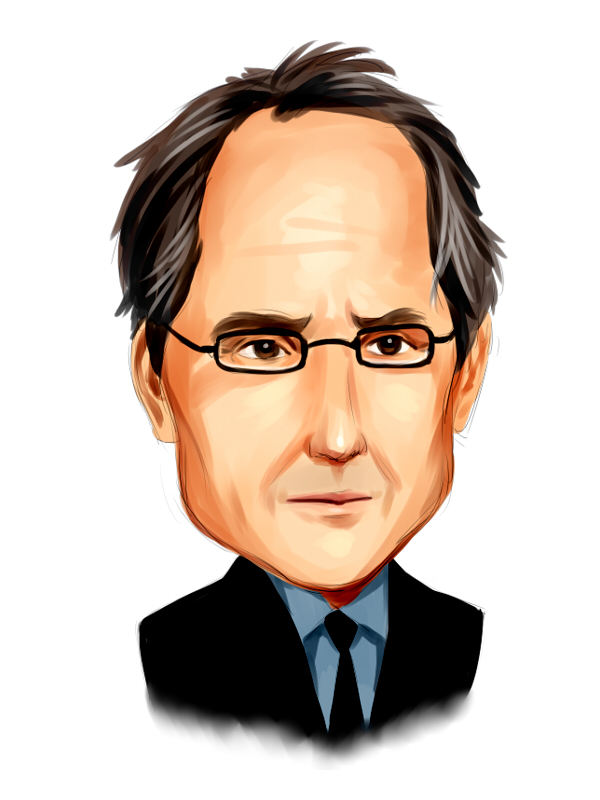 Renaissance Technologies had $8.7 million invested in the company at the end of the quarter. Benjamin A. Smith’s Laurion Capital Management also initiated a $5 million position during the quarter. The following funds were also among the new UA investors: Kenneth Tropin’s Graham Capital Management, Jeffrey Talpins’s Element Capital Management, and Richard Chilton’s Chilton Investment Company. Let’s go over hedge fund activity in other stocks – not necessarily in the same industry as Under Armour Inc (NYSE:UA) but similarly valued. These stocks are Grupo Aval Acciones y Valores S.A. (NYSE:AVAL), WEX Inc. (NYSE:WEX), Robert Half International Inc. (NYSE:RHI), and Allegion PLC (NYSE:ALLE). This group of stocks’ market values match UA’s market value. As you can see these stocks had an average of 19 hedge funds with bullish positions and the average amount invested in these stocks was $419 million. That figure was $700 million in UA’s case. WEX and RHI were the most popular stocks in this table. On the other hand, Grupo Aval Acciones y Valores S.A. (NYSE:AVAL) is the least popular one with only 6 bullish hedge fund positions. Under Armour Inc (NYSE:UA) is not the most popular stock in this group but hedge fund interest is still above average. This is a slightly positive signal but we’d rather spend our time researching stocks that hedge funds are piling on. In this regard, WEX or RHI might be better candidates to consider a long position.